The below services are available to help guide each individual's spiritual, mental, emotional and physical state. Reiki is a hands on energy transfer healing therapy, that can help to understand the connection between the four areas and help to pinpoint certain congestions. Treatments are a personal and private journey that are intended to help decongest your chakras and toxins, to provide more balance and harmony in life, and your personal energy field. ​"WHAT IS INVOLVED IN A TREATMENT?" Treatments typically last one hour and involves the therapist placing their hands on 10 various points of your body to align and balance your seven chakras. The therapist will channel a smooth flow of energy to harmonize the body and mind. Reiki can be done regularly, or as and when the body and soul feels the need. It enhances the general health and wellbeing of a person, and can be safely used alongside conventional medicine and during medical treatments and procedures. It provides our mind and soul with a sense of balance and serenity, whilst boosting our immune system by stimulating the detoxification process in our chakras. After your session a short discussion of any information or congestions from the treatment will be discussed with you, and a summary of your treatment sent to you for your records. All treatment experiences will differ according to the individual's current state, and needs. Occasionally messages or feelings can be channeled to the client through the therapist such as timelines, or names relating to specific events. On other occasions maybe just a relaxed state is felt. In both situations, the same amount of energy is still being channeled by the therapist. Each experience will vary, as does each client. Reiki treatments should be done on a one to one basis to get the most out of your session. On an energetic safety level it is recommended to avoid group shares as it is possible for another person's energy to interfere or connect with you, and vice versa during the treatment. The energy transferred therefore will not be of the highest standard, or most beneficial to you. If you choose to attend a group or reiki share, it is recommended to check yourself energetically after the session, and sage and cleanse yourself and surroundings. All treatments are confidential. For more information on available treatments, or any concerns please contact me directly. For those seeking life balance, self understanding and inner peace. Reiki treatments will instill a relaxed state of the mind, spirit, body and soul. Through decongesting your chakras, and identifying blockages. Regardless of your age, race, religion, or belief system. Reiki is a subtle gentle healing power suitable for all, including animals. 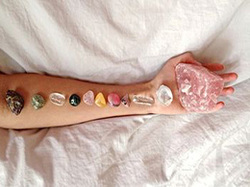 Crystals in their natural form are a powerful healing tool, each with their own beneficial properties. Relax and feel their unique vibrational energies. Combined with a pendulum diagnosis to pinpoint specific timelines and blockages. Available separately or combined with Reiki treatments to enhance the energy healing process. As we connect on a daily basis with others, keeping our energy field and aura clean is important to ensure our mind, body and soul stay balanced. If you are feeling energetically "off" or ungrounded, this is a quick and effective way to check up and ensure your energy field is clean, and any negative and unwanted energy removed.